Papeda Citrus fruit refer to a subgenus of citrus. They are round fruit with a thick, bumpy skin and may be yellow or green, depending on the variety. They are generally small fruit, and at maturity can be 2 centimeters to 7 centimeters in diameter. When cut open, they are segmented, and often have many large seeds. The pulp may be quite dry, and the taste may be extremely sour, bitter or acidic. Papeda Citrus fruit may be quite aromatic, as some varieties do release fragrant oils that smell like lemons. They are typically slow-growing, and appear on medium-sized thorny shrubs. Papeda Citrus fruit are generally found year-round. Papeda Citrus fruit are one of the oldest, most primitive forms of citrus, and have strong genetic ties with other citrus, particularly with limes. There are around 15 species in the Papeda Citrus group, including the kaffir lime, yuzu, wild orange, alemow citrus and sudachi. More rare Papeda Citrus types include the Khasi Papeda, which is often mistaken for a kaffir lime. Many types of Papeda Citrus occur in the wild, and there may be numerous hybrids that have not been well documented. Like most citrus fruit, Papeda Citrus contains vitamin C.
Papeda Citrus fruit tends to be unsuitable for culinary uses as they tend to be bitter, sour, or very acidic. 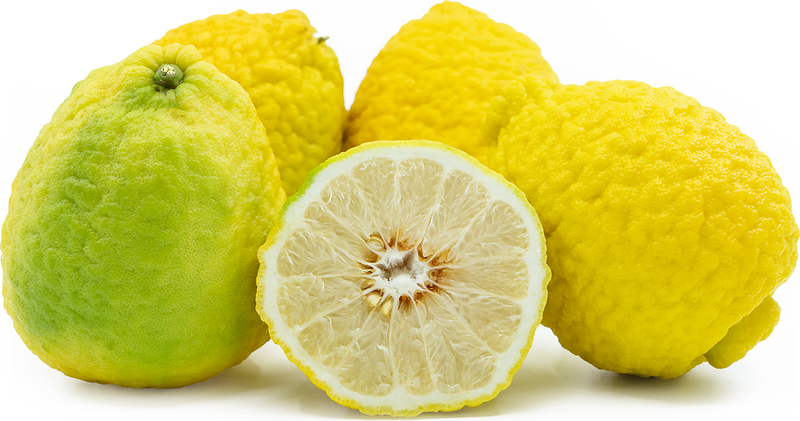 However, their rinds may be used as a citrus zest. Papeda Citrus juice has been used as a cleanser. In Malaysia, Melanesia and Polynesia, it was once used to wash and perfume the hair. Varieties of Papeda Citrus fruit have also been used by indigenous people for medicinal and digestive purposes. The exact origin of Papeda Citrus is unknown, but the fruit are believed to have originated in the Malay Archipelago in Southeast Asia, where they have been growing for an estimated 2,000 years. Today, they are found in many parts of Asia, including the Philippines, Borneo, India, China, and Japan, occurring in both tropical and arid regions. However, Papeda Citrus are the least cultivated species of citrus fruit due to their sour or bitter taste.